Get to know Spain in just seven days on this tour from Malaga to Madrid and Andalusia's most famous cities: Granada, Toledo, Cordoba, Seville and Ronda! You’ll visit beautiful sites like the Great Mosque of Cordoba, the UNESCO World Heritage-listed Alhambra palace, the Generalife Gardens and Seville's Alcazar, and you’ll hear interesting commentary from your guide. Enjoy sightseeing tours of Toledo and Madrid and have free time in Seville, Madrid and Ronda to explore the cities at your own pace. 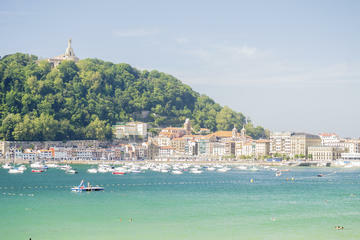 Enjoy a 7-day tour from Malaga to some of Spain’s most beautiful cities. Visit Madrid and explore the Andalusia region with visits to Granada, Toledo, Cordoba, Seville and Ronda. Enjoy guided tours of Cordoba, including the Mosque and Jewish quarter; Seville, where you will visit the Santa Cruz quarter and the famous Alcazar; and Granada, where you’ll admire UNESCO World Heritage-listed Alhambra palace and the Generalife Gardens. 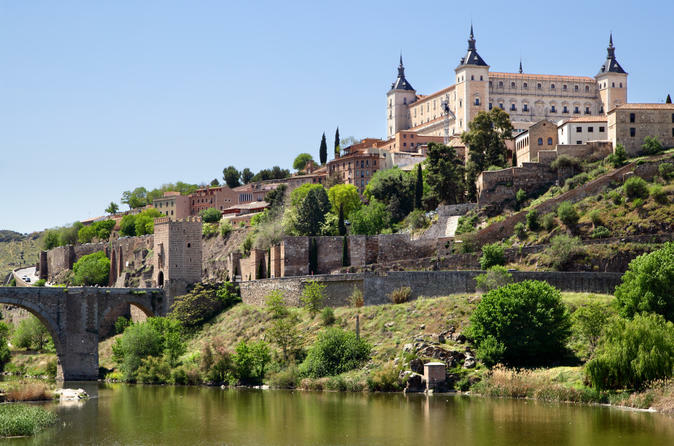 Head to Madrid for a panoramic sightseeing tour of the city and discover the Imperial City of Toledo, a UNESCO World Heritage City and the hometown of painter El Greco. Learn more about the famous Spanish culture with an optional flamenco dance performance in Seville and a walking tour around Cordoba's old quarter. 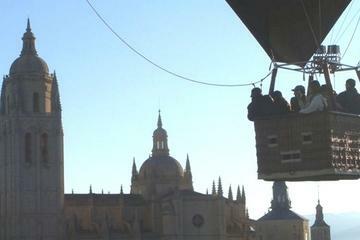 Enjoy free time in Ronda, Seville and Madrid to explore more at your own leisure. Six nights of accommodation in standard or superior hotels (your choice), six breakfasts and three dinners are included. 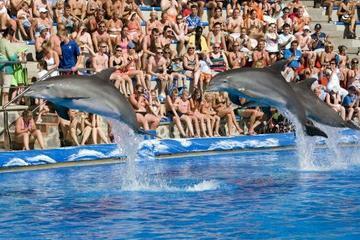 Start your 7-day tour of Spain traveling by comfortable coach from Malaga to Granada. With your guide, visit UNESCO World Heritage-listed Alhambra palace and the Generalife Gardens, an amazing historic site that served as the last stronghold of the Moorish Kingdom until 1492. Have lunch at a local restaurant (own expense) before heading to your hotel for dinner and an overnight stay. At night, you may take an optional gypsy tour. This tour is focused on gypsy legends. After breakfast at your hotel, relax on the drive to Toledo, a UNESCO World Heritage City where the three cultures of Spain – Christians, Moorish and Jewish – are melted together. 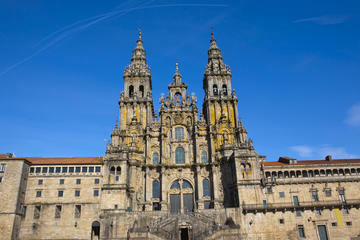 After lunch (own expense), take a tour of the city’s interesting architectural mix of mosques, synagogues and churches. Wander through the narrow streets and visit Toledo to see famous Damasquinado – an ancient technique of hammering gold into slits in metal, followed by an oxidizing process to create the blackened areas. 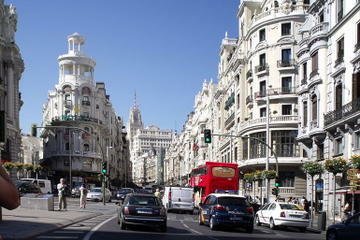 Proceed to Madrid for dinner (own expense) and an overnight stay. Start your morning with breakfast and spend the day exploring Madrid, the capital of Spain. 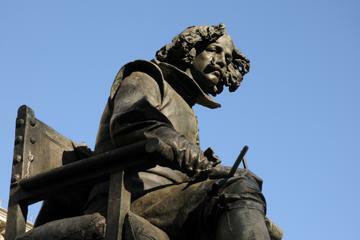 Go on a guided sightseeing tour and see top Madrid attractions such as Plaza de España, one of Madrid's most beautiful squares, where you'll see a statue of the Spanish writer Miguel de Cervantes. Enjoy lunch (own expense) and spend the afternoon at your leisure visiting various historical sites, such as Plaza de España, and discovering the enchantments of this beautiful city. Dinner is not included on this day, but your guide will happily recommend the best local restaurants that offer paella, the traditional dish for which Spain is famous. Enjoy breakfast at your hotel before enjoying the whole day on your own to discover scenic views, try local appetizers, or wander through the quaint, narrow streets. See Plaza Mayor, built in typical Herrerian style, and pass by Almudena Cathedral, a place of worship since the city's earliest settlement. Be amazed by the magnificent Templo de Debod, a 4th-century-BC Egyptian temple which was saved from the rising waters of Lake Nasser and transported block by block to Spain in 1970. At night, relax at an elegant restaurant for dinner (own expense) or check out the local nightlife. After breakfast at your hotel, relax on the drive through the land of Don Quixote to Cordoba. Take an optional walking tour of Cordoba’s old town, a UNESCO World Heritage Site and the second-largest old town in Europe. Visit the Jewish Quarter (Juderia), part of Cordoba's historic center, and follow your guide through its medieval streets. Visit the gorgeous Cordoba synagogue and learn about Cordoba’s Jewish history. After a break for lunch (own expense), head to the most famous landmark in the city – the Great Mosque of Cordoba. Have a look inside and admire the forest of columns and red-and-white arches. Then, board your coach for the drive to Seville, where you’ll enjoy a delicious dinner and spend the night. 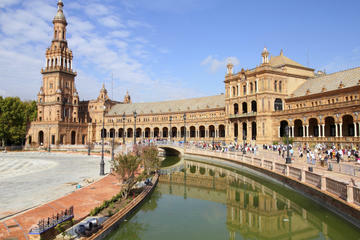 After breakfast, spend the day in Seville, the capital of the Andalusia region and the cultural center of Southern Spain. Enjoy a panoramic city tour with your guide and visit sites such as the Cathedral of St Mary, one of the largest Gothic cathedrals in the world. Then, take a guided walking tour of the Santa Cruz quarter, the former Jewish quarter with winding alleys and picturesque lime-washed houses. See the famous UNESCO World Heritage-listed Alcazar, Seville’s magnificent royal palace. After a short lunch break (own expense), continue your tour around the Alcazar and to the beautiful Maria Luisa Park, home to grand Plaza de España. You’ll have the rest of the day to discover more of the city on your own. After dinner (included), you have the option to go on a flamenco tour to see a performance of Spain’s traditional flamenco dance (own expense). Have breakfast in your hotel and head off to Ronda. When you arrive, enjoy free time to discover every corner of this enchanting town independently. At your leisure and expense, stroll through this town of Celtic origin; soak in marvelous views of the valley and mountain range of the Serranía de Ronda; and learn about the history of this town at one of the various museums. In the early afternoon, depart Ronda for Malaga, where your 7-day tour will finish. Please note: Hotels are subject to change; if this happens, you’ll stay in hotels similar to the ones listed. - Child rate applies only when sharing with 2 paying adults; in the case of 3 adults and 1 child, 2 twin rooms will be required. - Children aged 3 years and under are free of charge, providing they do not occupy a seat on the bus. - Please note: any expenses incurred at the hotel (such as meals) should be paid directly to the hotel. Between 8am and 10:30am; you must contact the local service provider to verify your exact pickup time (contact info will be printed on your confirmation voucher).